I honestly don't know a whole lot about Richard Carranza. I see good and bad things. On the plus side, he's a former English Language Learner, or ELL. This gives me hope that he might see through the miserable Part 154 that robs ELLs of both direct English instruction and also core content instruction. In 2017, we ought to offer our most needy kids something better than sink or swim. Also, he seems to be an advocate for public schools. The last guy the mayor picked, Tom Carvel or somebody, looked like an advocate for school choice in the Jeb Bush mode. Florida's not where I would go to model public schools, though the weather seems pretty nice. Alas, Carvel not only failed to bring the weather over, but also failed to show himself. 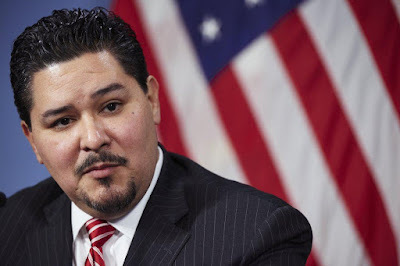 On the other hand, there are the stories about Carranza, largely in the Daily News, from his failure to perform miracles, to creepy treatment of female subordinates, resulting in a 75K payoff. I'm not personally too put off by the miracle thing, because miracle stories, like accomplishments of Texas and Michelle Rhee, usually turn out to be outright fabrications. Carranza seems to have a thing for TFA, while I think he'd be better off finding local talent. In fact, I wonder why the mayor couldn't find anyone in NY. The mayor said mayoral control was all about him doing what he wanted to do, but that's not really true. When de Blasio was elected, he not only stated opposition to charters, but also blocked a Moskowitz Academy or two. Cuomo and his Heavy Hearted Assembly rapidly passed a law that NYC would have to pay rent for charters of which it didn't approve. This said to me that mayoral control was valid only if the mayor was a reformy. They never passed laws against Bloomberg. Evidently, de Blasio hasn't put that together just yet. Carranza says there's no daylight between his vision and that of the mayor, but I have no idea what the mayor's vision is anymore. When he first ran, he seemed great. He opposed charters and reforminess. He was the anti-Bloomberg. I supported him even as the UFT was pushing that guy, what's his name, who told the Daily News that teachers didn't deserve the raise cops and firefighters got. These days I have no idea what the mayor stands for. He left a whole bunch of Bloomberg's people in place, so we still lose at step two hearings even when we're 100% correct. He left a bunch of scumbag lawyers in "legal" who believe in doing whatever the hell they feel like and think screwing UFT members is the national pastime. He picks an outright reformy to be chancellor and then immediate turns around and picks a guy who appears to support public schools. Though the NY Post thinks de Blasio's Che Guevara, he negotiated the lowest pattern bargain in my living memory for city workers. That says, roughly, if I'm rich or if I'm broke, I do any damn thing I feel like, and my word is the law. It's the kind of song Donald Trump might tweet if he had any music in his miserable, barren soul. El Rey is about a man whose "queen" appears to have dumped him for his miserable attitude, a man who's learned nothing whatsoever from it. While it's tongue in cheek, I'm not at all sure I'd teach it in a class. Given Chancellor's Regulation A-421 about verbal abuse, I'd be very nervous about it. You know, it might make some student feel uneasy. I might be sitting in the principal's office being accused of sexism and getting a letter in my file for sharing that song, but there's our chancellor, with an orchestra full of students, performing it. Putting the potential sexism aside, the notion of being the king is the kind of thing I'd expect from Bloomberg or Trump, not an educator. Does the new chancellor have a sharper sense of humor than I do, or is he broadcasting the future?